Vermont, picturesque and lovely, attracts visitors from across the country in search of the perfect fall foliage or perhaps a taste of maple syrup. Stansbury is best known for the odd covered bridge that spans Stansbury Lake and goes nowhere, connecting no roads and serving no known purpose. The locals call it the Lakebridge. Very few know of its mysterious origins and fewer care to know more. Those visiting the town perhaps take a few snapshots and leave, their curiosity quelled by an uneasy feeling that they shouldn't think about it anymore. The tourists will eventually leave Stansbury, but its residents strangely linger, seemingly held captive by a force they barely recognize. They also do not think about the town's mysterious artifact much except in passing, all but Gil, his father, Ben, and a few others. They know of the bridge's dark history and understand that it is responsible for every horror that ever befell the people of Stansbury. The bridge makes people do things - bad things - so that it can continue to love and care for them all. Some have tried to destroy the bridge, but as long as the bridge is fed with the lives of the innocents of Stansbury it will go on - loving the people of Stansbury. 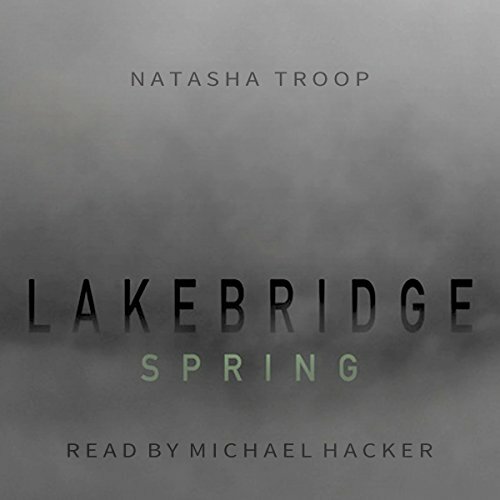 What did you love best about Lakebridge: Spring? I loved that it was a psychological horror. It reminded me of Stephen King where everything leads to that insanely explosive third act! Trying not to give away any spoilers, let's just say the moose POV is priceless. Gill is my favorite character because no matter what happens to him (including losing an arm) he always moves forward. He's had the most horrible things happen to him, but he somehow remains optimistic. Which character – as performed by Michael Hacker – was your favorite? Deputy Steven Marsters. He's one of the characters you're supposed to hate, but he's so much of jerk you actually end up being more amused by him. And Michael Hacker reads this perfectly, it only added to the humor! I don't want to give away any spoilers, but the ending was a mind-blower. I can't wait for the next installment! Michael Hacker's reading really sucked me into this story. and I just can't wait till the book is available on Audio. I must know what happens next! One of the most original books I have ever come across. I love the music of the language and the slow development from character to character. This is not simple storytelling. It doesn't travel from point A to point B, but all over and through. It reminded me of Mrs. Dalloway in the way it moved from person to person. Each character is so unique. And it was scary, but not conventionally so. It was scary because I cared about these people and worried for them and as the book went on, I didn't want to see bad things happen to them and kept waiting for the axe to fall. The ending stunned me because it wasn't happy and it wasn't resolved. Life doesn't always have neat and clean endings. The heroes don't always win. At least there are sequels! I never knew where it was going, but everything made sense when it got there. What about Michael Hacker’s performance did you like? He captures the essence of the characters. I loved listening to him. Everything with Ivy, the dog.